If you are looking for opportunities to work, learn, and have fun in meaningful, socially engaged ways -- check out the listings below! More listed under the Summer Opportunities page. Please let me know if you'd like help or more information with any of these, or if you have other ideas I can help you with. 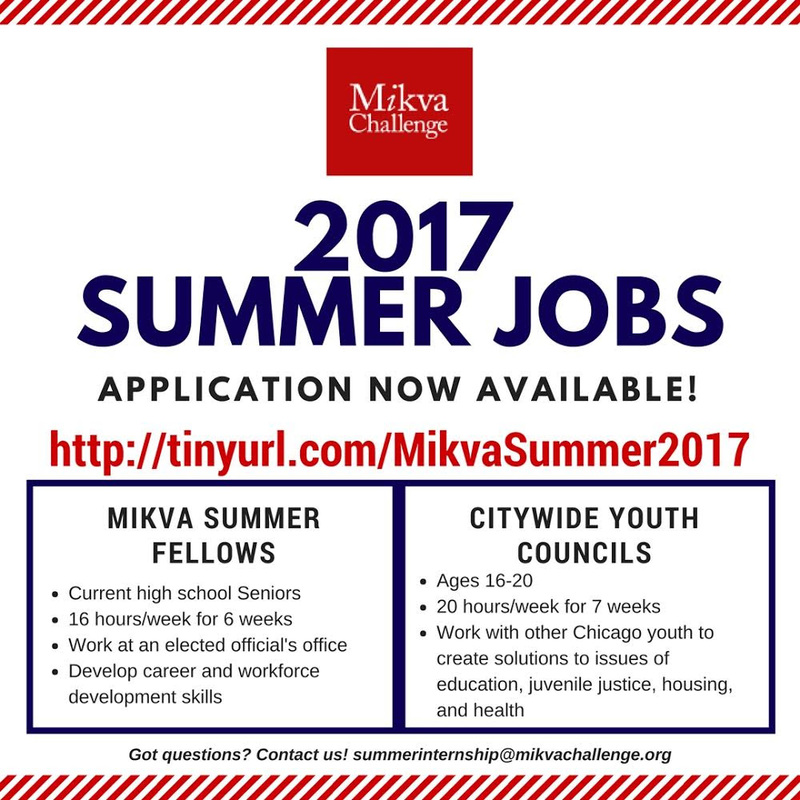 Chicago Students: Apply for Summer Jobs with Mikva! 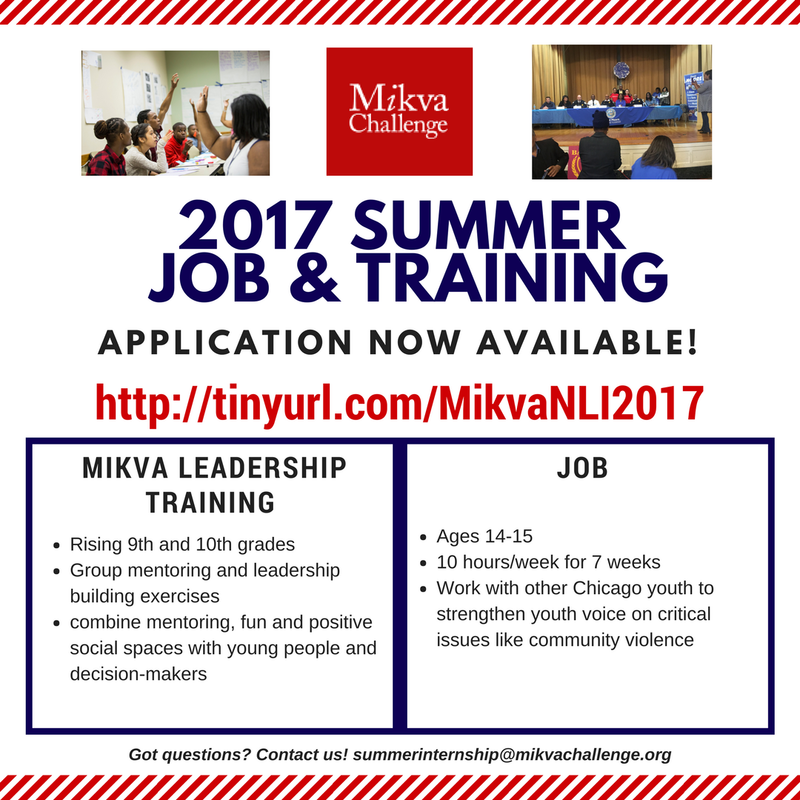 Mikva's application for students to apply for summer jobs at Mikva is now available at http://tinyurl.com/MikvaSummer2017. Students can apply if they are 16-20 years old and live in the city of Chicago (or Cook County). Internships will run 6-7 weeks from June to August. More information about what the jobs entail and why students should want to apply are all found on the application page. Applicants are required to attend one of three open interview sessions that will take place on April 24th, 25th or 27th at Mikva Challenge from 4pm-7pm. The deadline to apply is Friday, April 21 at 5:00 PM. Students with questions should email summerinternship@mikvachallenge.org. Our student application for our new Neighborhood Leadership Initiative is now available! Students can apply for this 18 month program if they are currently in 8th or 9th grade and live one of five Chicago neighborhoods: Englewood, New City, North Lawndale, Roseland or South Lawndale. This new initiative will combine the best of Mikva's youth leadership and activism programs, youth voice in local decision making, intensive mentoring and support for high need youth, and exploration of racial and gender equity issues in Chicago and the country. Interested students should apply at http://tinyurl.com/MikvaNLI2017. The deadline to apply is April 21 at 5:00 PM. Contact AJ Johnson-Garrett at aj@mikvachallenge.orgwith any questions. Chicago Freedom School's Summer Fellowship! Are you looking for tools to make positive change in your community? Do you want to build diverse friendships and a family with like-minded peers and supportive adults? Do you want to develop your voice, skills, and power to fight injustice? Chicago Freedom School's Summer Fellowship might be for you! Click here to find out more and to apply. The deadline to apply is May 1. For more information, contact Tony at tony@chicagofreedomschool.org. 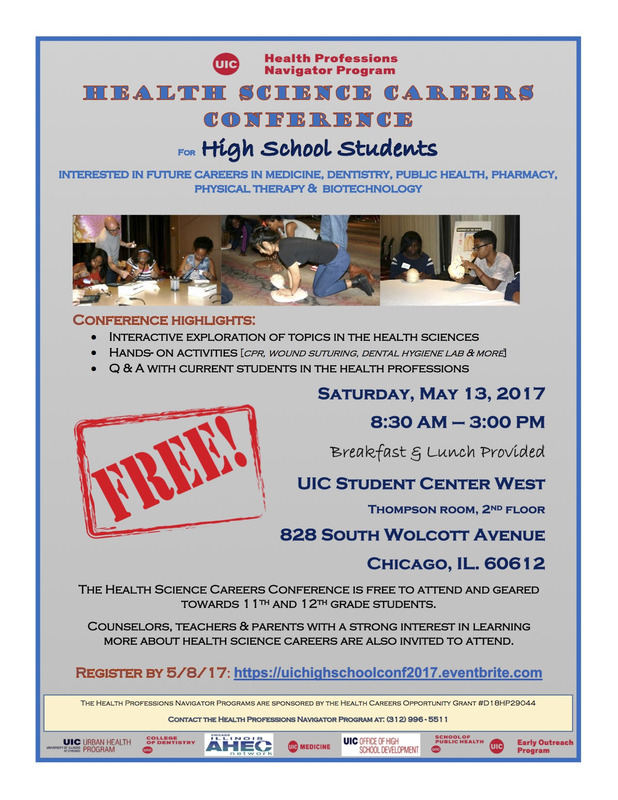 UIC will be hosting a Health Sciences Career Conference for High School Students, Teacher and Counselors. The Conference will take place on Saturday, May 13 from 8:30 AM – 3:00PM at UIC’s Student Center West (828 South Wolcott Avenue). The conference will have two tracks, one for the students and the other for educators. Please contact Darryl Pendleton at dpendle@uic.edu or 312-355-1670 with any questions. This event is aimed to support students and their families in navigating the uncertain times that we live in. There will be a college and resource fair along with a panel and a series of workshops discussing topics such as "Know Your Rights", mental health, postsecondary opportunities, and services available at the City Colleges of Chicago. Are you a rising junior or senior interested in democracy studies, legal studies, or theater and creative activism? This summer, Hampshire College offers a Precollege program that invites students to imagine money in politics differently. In Citizens United, we’ll explore fundamental questions about how free speech and civic participation work according to current campaign finance laws. Using improvisation, role-play, and creative writing, we’ll ask: What are the limits and possibilities to defining money as speech? Does the equal right of a person, human or corporate, to participate in public discourse lead to unequal influence in public opinion? What is meaningful speech? The program will be taught by the amazing artist Adelita Husni-Bey and myself, a curator and Hampshire alum. Throughout the program we’ll work with lawyers and activists, including the co-founder of Free Speech for People and a lead organizer at Represent.Us. Citizens United will run this summer from July 17-28. As one of the lead instructors for this program and a Hampshire alum, I’m happy to talk more with you and any interested students about the program and the academic philosophy at Hampshire. I'm really excited about this program and think it could be a great way for students interested in self-directed, interdisciplinary study to get to know the Hampshire campus.